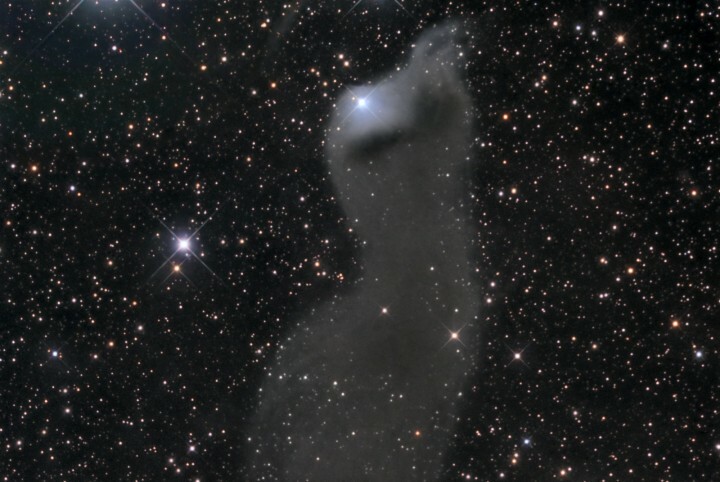 Described as a “dusty curtain” or “ghostly apparition”, mysterious reflection nebula vdB 152 really is very faint. It lies about 1400 light-years away, along the northern Milky Way in the royal constellation Cepheus. Near the edge of a large molecular cloud, pockets of cosmic dust in the region block light from background stars or scatter light from the embedded bright star (top) giving parts of the nebula a characteristic blue color. Ultraviolet light from the star is also thought to cause a dim reddish luminescence in the nebular dust. Though stars do form in molecular clouds, this star seems to have only accidentally wandered into the area, as its measured velocity through interstellar space is very different from the cloud’s velocity. This deep telescopic image spans about 7 light-years at the estimated distance of vdB 152.